RUSH: There has been a development, ladies and gentlemen. 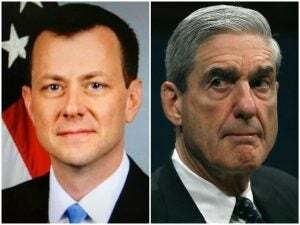 You know the texts between Strzok and the mistress that have been revealed, something like 10,000 of them. One of those texts, Strzok is sending a note to the mistress, Lisa Page, after they’ve had a meeting in Andrew McCabe’s office. McCabe’s the number two guy at the time at the FBI, whose wife is a big Democrat, is running for the Senate in Virginia, took money from Terry McAuliffe’s coffers. So dyed-in-the-wool Democrats. We don’t know if McCabe is, but, I mean, what are the odds? So now we’re having to be comforted, “Well, don’t worry. I mean, the FBI is made up of people with the highest integrity and their personal political beliefs would in no, no, way influence –” yeah, well, that’s what they used to tell us about judges too. And former FBI directors are weighing in on how this current crop in the leadership dismays and disappoints them. So, once again, common sense, intelligence guided by experience, when we are told by the very people trying to destroy Donald Trump to pay no attention to the political leanings of the investigators, we would be wise to ignore and do just that, just the opposite. So in one of these texts after a meeting in McCabe’s office, apparently Lisa Page tried to comfort everybody and point out that there was no way that Trump was gonna win, to not worry about it, she just couldn’t see a way forward for Trump to win. And, lo and behold, most people — again, using common sense — thought that Strzok was talking about an insurance policy that either prevented Trump from winning or dealing with Trump after he won in such a way as to get rid of him. Since that was the objective. These people didn’t want Trump elected. They were giving Hillary Clinton a pass at every turn. They were exonerating her. They were doing a sham investigation of her and then exonerating her. They were hell-bent on her winning, and they were definitely certain she was going to. In other words, the insurance policy was exactly what’s happening now, the special counsel investigation, the rigorous examination of collusion charges between Trump and Russia, that was, according to the Wall Street Journal, the insurance policy. And so now the Drive-Bys are claiming that the Wall Street Journal piece shows that what Strzok was texting about wasn’t so bad after all. They claim he wasn’t talking about stopping Trump from winning. No, he was just talking about if Trump wins, we’re gonna have to really investigate this clown afterwards. Come on. How stupid do they think we are? And I think they think we’re stupid. I don’t know about you, but people who insult my intelligence, that’s one of the biggest pet peeves that I have. I think it’s nonsense. It’s clear that Strzok wanted to ratchet up the FBI’s investigation of this because he thought Trump stood a chance of winning and the investigation could prevent his election. That’s what these people were all about! Lisa Page tells them (imitating Page), “Don’t sweat it. I’ve looked at it. 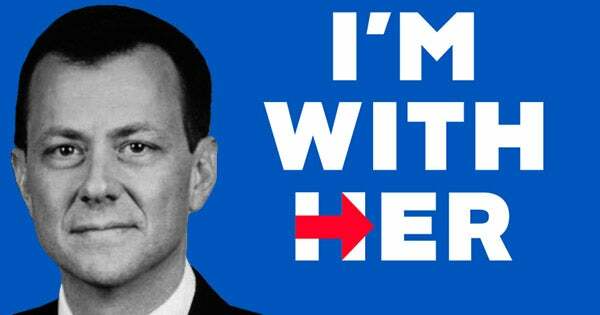 There’s no way this guy wins, I’ve been talking to Nate Silver and ESPN and everybody else measuring, the New York Times, they say he’s got no chance.” Strzok doesn’t want to trust that, says we need a Plan B insurance policy, and the insurance policy is to investigate Trump? I don’t believe that. Now, maybe the plan B has a plan C, and that is to undermine the Trump presidency if they can’t stop him from winning. The days, folks, of me buying these Drive-By Media inside-the-Beltway Washington establishment explanations that violate what we can plainly see in front of us, that violate our common sense, I’m sorry, they just don’t register with me anymore. Everything that’s going on now is to drive Trump out of office. Do you notice that Jesse Watters at Fox News got in heap big doo-doo for something that a lot of people have already said? You haven’t heard about this? Do you know who Jesse Watters is? I’m talking to Snerdley and the staff on the other side of the glass, the highly overrated staff. Jesse Watters used to be one of O’Reilly’s roving on-the-street guys to hopefully bring down O’Reilly’s aging demographic. (interruption) You like Jesse? Jesse’s a good guy. He got his own show after O’Reilly left, and now he’s one of the headliners on The Five, the Fox show at five o’clock. And on, I guess it was Saturday, I don’t know, he was doing something on Fox on Saturday and he accused the Mueller investigation of being a coup to get rid of Trump. And Mount Vesuvius descended on poor Jesse. He’s by no means the first. But I guess he may be the first on Fox to say it. But I can’t believe Hannity hasn’t said it or alluded to it. We’ve talked about it here for weeks that there is a silent coup. Now, I don’t know that I have specifically said that the Mueller investigation is the coup. I think this entire effort, I’ve described it as a silent coup to get rid of Trump. The administrative state, deep state, all this stuff from these mythical sources in and out of government, present and former, leaking to the New York Times and Washington Post, no names ever attached. But when Jesse Watters came out with it, everybody stopped, “You can’t say that. That’s outrageous! That is the most irresponsible thing that anybody’s ever said.” But it wasn’t the first time it’s been said. But something about that utterance of it set them off. And I think the proximity of his allegation, accusation, so close to what we have now learned about the texts between Strzok and his mistress and the conversations in McCabe’s office and the wildly unbalanced Mueller investigative team. Why does he need 17 lawyers, and why does every one of them have to be a Hillary loyalist, devotee, donor, fundraiser, bundler? Why do they all have to be of the same stripe? Seventeen lawyers to investigate this? And they all have staff. I mean, 17 lawyers is just one aspect of it. And after all this time, they haven’t found anything that’s related to what everybody thinks they’re investigating. And so Jesse comes out there and calls it a coup, and you would think that one of the most sacrilegious statements ever about respected members of the establishment has ever been uttered. (interruption) No, no, no, no, no, no, no. No. That’s not my point. My point is, no, I’m wondering why this particular observation of there being a coup has set them off when so many previous utterances were ignored. There has to be a reason for it. There’s always a reason. There’s always an explanation. And it’s never obvious. Never aboveboard.